Diwali celebrations are in full swing, which means India is gleaming with lights, pomp, fireworks and a high festive spirit. With Dhanteras of the North and Naraka Chaturdashi of the South behind us, Kali Puja in the East is the next highlight of the festival. 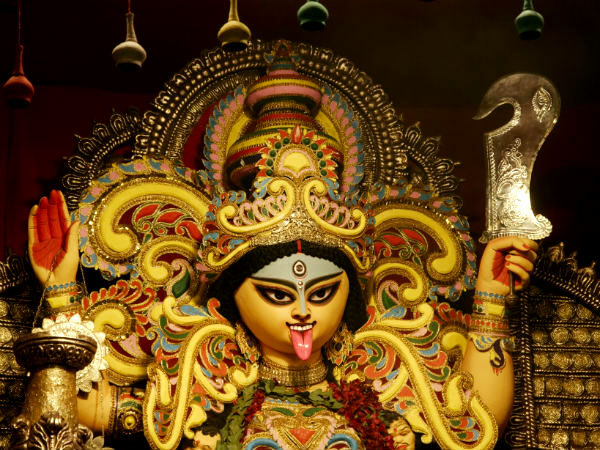 While most of the country might be busy dedicating their celebrations to Goddess Lakshmi, eastern regions of India, such as West Bengal, Assam, Odisha and even Bangladesh celebrate Kali Puja. Sometimes known as Mahanisha Puja or Shyam Puja, Kali Puja is celebrated on the third day of Diwali which falls on the 19th of October this year. Much similar to the popular Durga Puja, pandals are put up throughout the place during Kali Puja. Idols of Goddess Kali that are made of clay are placed in these pandals, along with images of Lord Shiva, who is her consort and of Ramakrishna and Bamkhepa, who are popular Kali devotees in West Bengal. As offerings, many of these pandals keep red hibiscus flowers, sweets, rice and sometimes fish and meat. Kali Puja gained widespread popularity only in the 19th century and was introduced in the 18th century by King Krishna Chandra of Nabadwip. Of all the Indian eastern states, celebrations are seen with utmost grandeur particularly in West Bengal. You can find bhog being served in pandals, in the form of khichdi and labra. The puja is usually concluded with a hearty mangsho or goat meal. According to the story, two demons named Shambhu and Nishambu challenged Lord Indra, King of Gods, and desired to capture heaven. Following a series of events after that, all gods sought after Goddess Durga's protection. This was when her incarnation as Goddess Kali, who is believed to have emerged from her forehead. After slaughtering the demons, she made a garland of their heads. The killing spree blinded her and she continued killing everyone who came in her way. In order to stop this, Lord Shiva threw himself under her feet. Goddess Kali stuck her tongue out with utter shock by this gesture and this is the image of the goddess which is now used for worshipping. Kalighat Temple in Kolkata and Kamakhya Temple in Guwahati will be crowded with thousands of devotees during this time of the year. Kalighat is one of the most sacred Kali temples that is nestled in the old course of river Hooghly. The temple comprises of a Sosthi Tala, which is a samadhi of Brahmananda Giri where all priests are females, a Radha-Krishna Temple and a Kundupukur, which is a sacred tank. The temple remains open from 4 am to 10.30 pm. Kamakhya Temple is a unique temple and the most popular attraction of Guwahati. Its uniqueness lies in the fact that there is no idol; instead, devotees worship the yoni of Goddess Kamakhya. It is also said that the river next to the temple turns red during a festival called Ambubachi, which represents the menstruation of the goddess. Other popular temples to visit during this time include Dakshineshwar Temple in Kolkata, Tarapith Temple in Birbhum, Tripura Sundari Temple in Boral, to name a few.